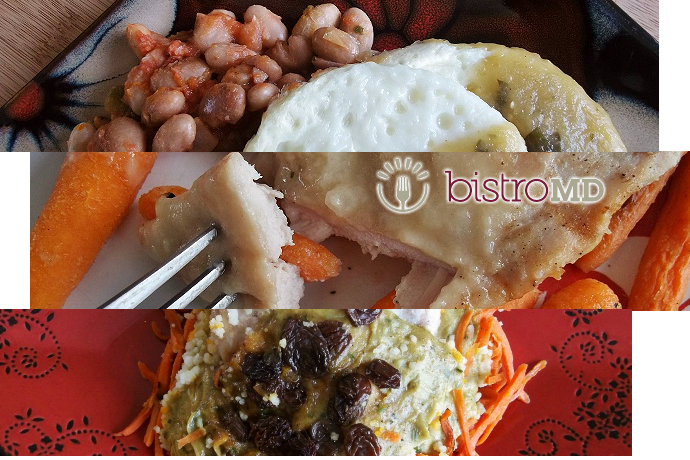 ***I received a 5 Day, meal only, plan from BistroMd for the purpose of this review series. No further compensation was provided.All content and images are original and copyright Momma Told Me 2013. While I am, personally, a big champion of the BistroMD mealplans, and approved all of the possible dishes eligible for my culinary preferences, Day 4 of this round disappointed in a sense. It's not that the entrees weren't flavorful, or filling, but the specific collection of these 3 dishes, together, was a bit underwhelming. 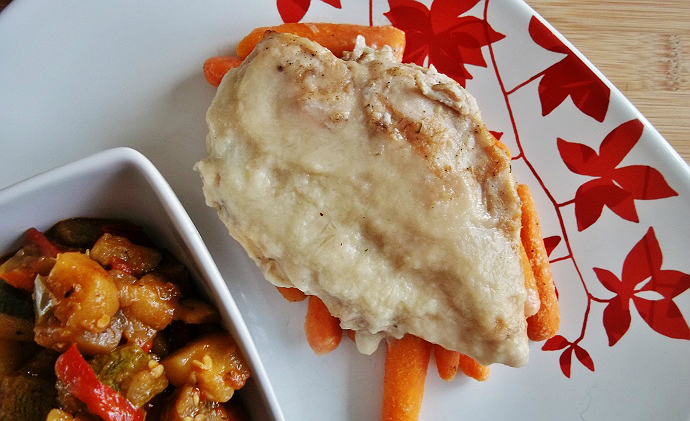 If possible, I prefer to have multiple protein sources throughout the day, and it seems this round of BistroMD meals has featured chicken predominantly. This particular day, my lunch and dinner entrees both featured a large chicken breast. I would have liked to have seen shredded or diced chicken, or even beef or pork on today's menu, but I must keep in mind that these meal schedules are designed by an actual nutritionist with the intent of providing well rounded nutrients first most. I'm sure no major harm would have come from my swapping a Day 5 entree with one of my chicken features, but I prefer to follow the plan as laid out for me. 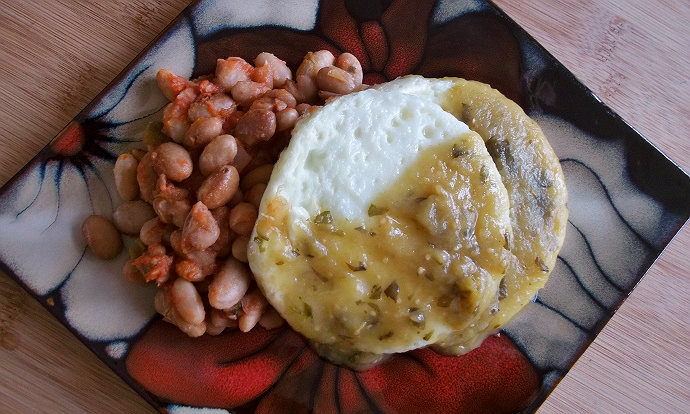 For breakfast this day I awoke to South of The Border Egg Whites with a breakfast pinto bean medley of peppers, onions, and tomatoes. I've never had pinto beans as a breakfast side before, but I quickly realized this is not much different than a vegetarian breakfast burrito! Plating the item individually, rather in a burrito format, allows me to give them more consideration while eating, and leads to that target 'full' feeling quicker. It's always a treat when I get to enjoy egg whites in the morning, and these round patties were no disappointment. While the aesthetics weren't appetizing, to me, the zesty salsa verda smothering my entree smelled enticing and kept the fluffy eggs palatable. My only desire at the end of the meal was that thee has been more sauce to drench the beans as well. For lunch I was greeted by a familiar entree, BistroMD's Gluten Free French Style Chicken Normandy. Okay, it sounds a little more refined than it actually is. This plate is more like what I would make for myself at home, when counting calories. 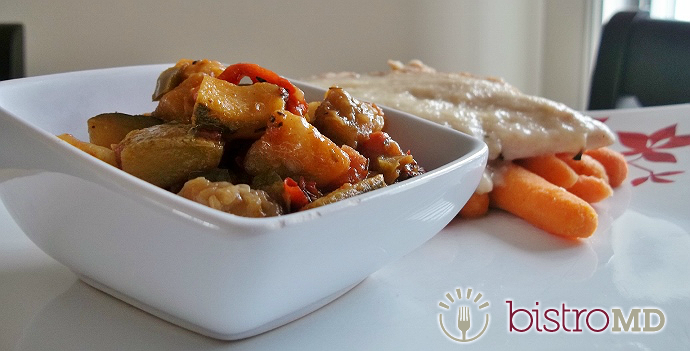 It features a medium sized grilled chicken breast in a light Normandy sauce accompanied by roasted carrot sticks and an Eggplant Ratatouille. The sleeve for this entree mentions diced apples alongside the Normandy, but I couldn't find them? Regardless, the Normandy sauce baked onto the chicken sort of like a cheese and stole a little moisture form the traditionally tender BistroMD breast. Luckily the Eggplant Ratatouille was quite indulgent and rich in flavor and moisture. I consumed this lunch by wedging chunks of ratatouille alongside a fork-full of chicken. At just 310 calories for this entire meal, I was stuffed well through the afternoon, and ate every bite. When dinner rolled around I was beginning to feel the pangs of hunger creep in and opened my fridge to pull the thawed Curried Chicken with Couscous out. This particular entree is not Gluten Free, and has a total of 330 calories. With a Thai appeal, the dish is packaged in a single compartment tray and features ingredients layered together, to be eaten as a whole component. 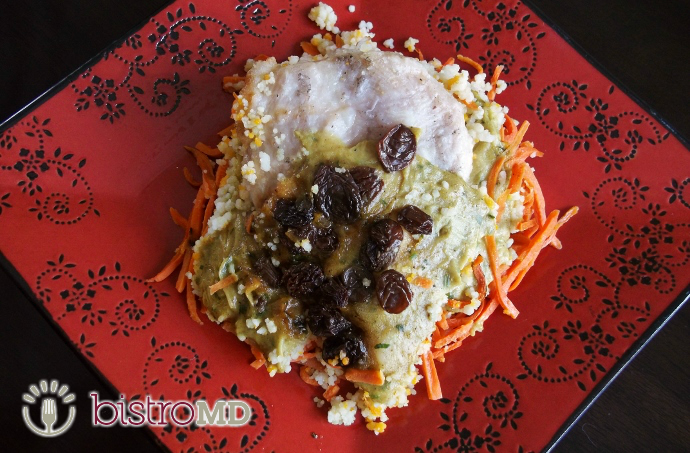 A large chicken breast is wedged between layers of tri-colored couscous in coconut milk and torn cilantro, served atop a bed of shredded carrots, and garnished with tender raisins. It's not a culinary creation I'd ever think up, but the savory couscous compliments the sweetness of the raisins and the texture of the carrots quite well. There's a bit of chewing involved in this meal, which lends to it's hearty portioning and the content full feeling when done. I actually couldn't finish my last bite, I was so stuffed! Day 4 wrapped with an 860 calorie count for entrees alone, and about 1350 calories overall including my snacks and a 100 calorie Skinny Cow dessert. Overall, this wasn't the most impressive day, though I enjoyed each meal, I'm looking forward to a larger variety on Day 5. This looks absolutely delicious! I need to try this!! I would love it! Curried anything is my favorite! I'm not a big chicken fan (usually pick it out of my meals) but the eggplant ratatouille....yes please! Looks yummy! I love couscous but my hubby don't. He love chicken though so this might be something he can consider eating.